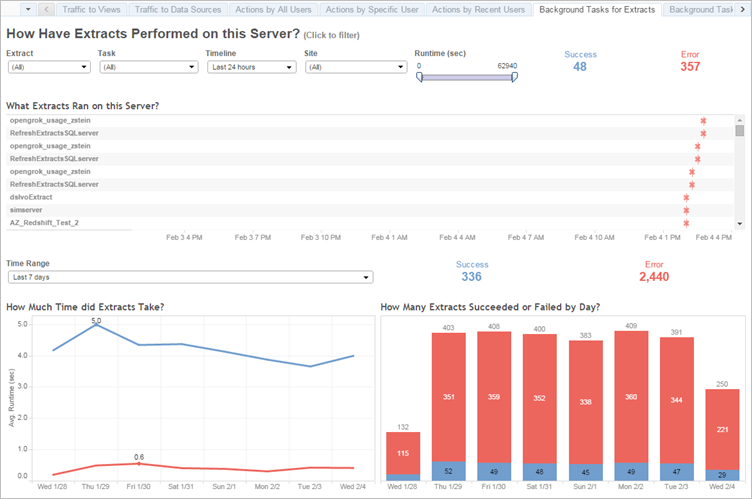 The Background Tasks for Extracts view displays extract-specific tasks that run on the server. This view gives you a snapshot of Tableau Online activity over the past 30 days. The table, "What Extracts Ran on this Server," lists the extracts that ran in the time period specified in Timeline. You can click Success or Error to filter the table based on status. You can also click a specific task to update the "How Much Time did Extracts Take" graph for the selected task. The table, "How Many Extracts Succeeded or Failed," updates for the status (success or failure) of the task, but the count of extracts that succeeded or failed does not change. Tasks can have a status of success or error. For details on about the task, use your mouse to hover over the success or error icon. For more information about the timeout limit for refresh tasks and suggestions for resolving these errors, see Time limit for extract refreshes.